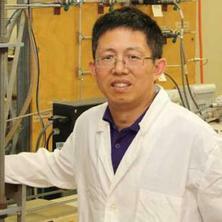 John Zhu is currently a Professor in the School of Chemical Engineering, UQ. He is also the inaugural Director of Carbon Energy Research Centre. He received his PhD in Chemical Engineering, UQ in 2002, then worked as a lecturer in Curtin University of Technology from 2002 to 2004. He moved back to UQ at the end of 2004 and has been working in the same school until present. He is the recipient of a number of awards and fellowships, including RK Murphy Medal 2013, Freehills Award IChemE 2011, runner up of Innovator of the Year Award International IChemE 2011, the University of Queensland Foundation Research Excellence Award 2007, an ARC Future Fellowship from 2013 to 2016, an ARC Queen Elizabeth II Fellowship from 2008 to 2012, an ARC Postdoctoral Fellowship from 2003 – 2005. In May 2012, John Zhu’s long term collaborative research with Eden Energy was recognised by Thomson Reuters Innovation Award for Innovative Collaboration between the University of Queensland and Eden Energy. John Zhu’s research interests and expertise exist in advanced catalysis, gas adsorption and separation, direct carbon fuel cells and solid oxide fuel cells with strong application focus on clean energy and environment. His current projects include research into scale up of direct carbon fuel cells, next generation solid oxide fuel cells, hierarchically-structured bulk materials for gas storage and catalytic reaction, carbon nanotubes/MOFs composite membranes, carbon nanotube reinforced polymer composites for automotive applications, advanced plasma-assisted catalytic processes for clean energy production and air pollution control. John has taught several engineering courses including Research Methods (CHEE7200), Heat and mass transfer (CHEE3002), and Engineering investigation and analysis (CHEE3010). He is currently lecturing a third year course, Reaction Engineering (CHEE3005). Wang, F.Y., Zhu, Z. H., Massarotto, P. and Rudolph, V. (2009). Advances in Integrated Modeling of Mass Transfer and Geo-mechanics in Coal Seams for CO2 Sequestration. In Columbus, F. (Ed. ), Progress in Porous Media Research (pp. 263-339) Hauppauge, NY, USA: Nova Science Publishers, Inc.
Ding, R. G., Finnerty, J. J., Zhu, Z. H., Yan, Z. F. and Lu, M. G. (2004). Hydrogen Storage by Carbon Nanotubes. In H. S. Nalwa (Ed. ), Encyclopedia of Nanoscience and Nanotechnology 5 ed. (pp. 13-33) USA: American Scientific Publishers. Preface to the special issue on "2016 Curtin-UQ Workshop on Nanostructured Electromaterials for Energy"
Zhu, John (2008) New Technology to reduce large scale emissions. AusIMM Bulletin, 1: . Zhu, Zhonghua, Zhuang, Yahui, Shen, Dixin and Lu, G. Q. (1999) Highly effective catalysts for N 2O conversion to N 2 - a preliminary study. Developments in Chemical Engineering and Mineral Processing, 7 5: 563-575. Zhu, Z. H., Zhuang, Y. H., Shen, D. X. and Lu, G. Q. (1999) Highly effective catalysts for N2O conversion to N2 - A preliminary study. Developments in Chemical Engineering & Mineral Processing, 7 5/6: 563-575. Rufford, Thomas E., Gao, Shuai , Arami-Niya, Arash , Villacorta, Byron S., Ge, Lei and Zhu, Zhonghua (2018). Methane adsorption on pitch derived activated carbon monoliths. In: 8th Pacific Basin Conference on Adsorption Science and Technology, Sapporo, Japan, (). 3-6 September 2018. Liu, Shan, Ge, Lei, Zhu, Zhonghua and Wang, Hao (2017). Hemp hurd derived activated carbon for CO2 adsorption. In: 21st International Conference on Composite Materials, ICCM 2017. 21st International Conference on Composite Materials, ICCM 2017, Xi'an, China, (). 20-25 August 2017. Arash Arami Niya, Zhu, Zhonghua and Rufford, Thomas (2016). CO2 adsorption on banana-peel derived hierarchical porous carbon foams. In: Carbon 2016, Penn State University, (). 10-15 July 2016. Gao, Shuai, Villacorta Hernandez, Byron, Ge, Lei, Rufford, Thomas and Zhu, Zhonghua (2016). Effect of hydrogen peroxide oxidation of carbon nanotube additives on the microstructure of pitch-derived activated carbon foam. In: Carbon 2016, Penn State University, (). 10-15 July 2016. Wang, Li, Zhu, John and Rudolph, Victor (2011). Nanotubular structured material supported Ru nanoparticles for preferential CO oxidation in H2 - rich stream. In: Chemeca 2011 Proceedings. Chemeca 2011: Australasian Conference on Chemical Engineering, Sydney, Australia, (1-10). 18-21 September 2011. Sitprasert, C., Zhu, Z. H., F.Y. Wang and Rudolph, V. (2011). Study on multi-component adsorption and poresizedistribution in carbonaceous porous media using molecular simulation. In: Chemeca 2011 Proceedings. Chemeca 2011: Australasian Conference on Chemical Engineering, Sydney, Australia, (1-8). 18-21 September 2011. Ding, R. G., Lu, G. Q., Yan, Z. F., Yao, X. D. and Zhu, Z. H. (2010). Hydrogen adsorption on metal-carbon nanocomposite. In: 7th Asia Pacific Conference on Sustainable energy and Environment Technologies, Qingdao, China, (). 15-18 October 2009. Lu, Gaoqing, Rufford, Thomas and Zhu, Zhonghua (2009). Mesoporous carbon from popcorn. In: Journal of physics. Condensed matter: Proceedings of the International Conference on Nanoscience and Nanotechnology. ICONN 2008: International Conference On Nanoscience and Nanotechnology, Melbourne, Vic, Australia, (). 25-29 February 2008. Patel, Archana, Rufford, Thomas, Chen, Jiuling, Rudolph, Victor and Zhu, Zhonghua (2009). Mesoporous supported catalysts for NOx reduction. In: Engineering our future: Are we up to the challenge. CHEMECA 2009, Perth, Western Australia, (1-10). 27-30 September. Rufford, Thomas, Jurcakova, Denisa, Cheng, Ching-Yuan, Zhu, Zhonghua and Lu, Gaoqing (2009). Supercapacitor electrodes of carbon derived from waste materials. In: International Green Energy NanoCarbon Conference 2009, Jeonju, South Korea, (). 3-6 November, 2009. Rufford, T., Jurcakova, D., Fiset, E., Zhu, Z. and Lu, G. Q. (2009). Waste materials as precursors for supercapacitor electrodes. In: Engineering our future: Are we up to the challenge. CHEMECA 2009, Perth, Australia, (1-11). 27-30 September. Yao, X., Wu, C. Z., Zhu, Z. H., He, Y., Cheng, H. M. and Lu, G. Q. (2008). Effect of Mn and Zr on hydrogen absorption in Mg-based nanocomposites. In: D. V. Schur, S. Yu Zaginaichenko, T. N. Veziroglu and V. V. Skorokhod, Hydrogen materials science and chemistry of carbon nanomaterials: ICHMS'2007, X International Conference. ICHMS'2007: X International Conference, Sudak, Crimea, Ukraine, (104-105). 22-28 September, 2007. Thomas Rufford, Denisa Hulicova-Jurcakova, Zhu, Zhonghua and Lu, Gaoqing (2008). Electrochemical energy storage in carbon from waste coffee grounds. In: ARC Centre of Excellence for Functional Nanomaterials Annual Conference 2008, Gold Coast, Australia, (). 5-7 November 2008. Giraudet ,S., Zhu, Z. H. and Lu, G. Q. (2008). Hydrogen storage in chemically modified mesoporous carbons. In: 17th World Hydrogen Energy Conference 2008, WHEC 2008: monograph. 17th World Hydrogen Energy Conference 2008, WHEC 2008, Brisbane, QLD, (595-598). 15 - 19 June 2008. Hulicova-Jurcakova, D., Kodama, M., Zhu, Z. and Lu, G.Q. (2008). Preparation and characterization of high-performance nitrogen-enriched carbons for supercapacitors. In: Abstracts CD ROM : International Conference on Nanoscience and Nanotechnology. ICONN 2008: International Conference on Nanoscience and Nanotechnology, Melbourne, Vic, Australia, (). 25-29 February, 2008. Ding, R. G., Zhu, Z. H., Yao, X. D., Lu, G. Q. and Yan, Z. F. (2008). Spillover-enhanced hydrogen adsorption on NiNaY composites at cryogenic temperature. In: 17th World Hydrogen Energy Conference (WHEC2008), Brisbane, Australia, (586-589). 15-19 June 2008. Ding, R. G., Zhu, Z. H., Yao, X. D., Lu, G. Q. and Yan, Z. F. (2008). Tailoring of pores of activated carbon fibers for H2 adsorption. In: ICONN 2008: International Conference On Nanoscience and Nanotechnology, Melbourne, Australia, (). 23-29 February 2008. Ding, R. G., Yao, X. D., Zhu, Z. H., Lu, G. Q. and Yan, Z. F. (2007). Effect of pore structure of activated carbon fibers on H2 adsorption. In: D. V. Schur, S. Yu Zaginaichenko, T. N. Veziroglu and V. V. Skorokhod, Hydrogen materials science and chemistry of carbon nanomaterials: ICHMS'2007, X International Conference. ICHMS'2007: X International Conference, Sudak, Crimea, Ukraine, (698-699). 22-28 September, 2007. Rufford, Thomas, Takagi, Hideyuki, Zhu, Zhonghua, Hatori, Hiraoki and Lu, Gaoqing (2007). Magnesium loaded carbon for hydrogen adsorption. In: Nanostructures for Electronics Energy and Environment (NanoE3), Couran Cove, Qld, Australia, (). 23-28 September, 2007. Hulicova Jurcakova, Denisa, Kodama, Masaya, Hatori, Hiroaki, Zhu, Zonghua and Lu, Gao Qing (2007). The role of nitrogen in capacitive performance of nitrogen-enriched carbons in aqueous and non-aqueous supercapacitors. In: Proceedings of: Carbon for Energy Storage and Environment Protection. Carbon for Energy Storage and Environment Protection, Krakow, Poland, (). 2-6 September 2007. Rufford, Thomas, Zhu, Zhonghua and Lu, Gaoqing (2006). Mesoporous carbon fabricated with an alumina template. In: Australian National Science Graduate Conference Abstract and Paper Book. Australian National Science Graduates Conference, Manly, NSW, Australia, (). 26-28 May, 2006. Rufford, T. E., Zhu, Z. and Lu, G. Q. (2006) Technology options for onboard hydrogen storage. Developments in Chemical Engineering and Minerals Processing, 14(1-2) Special theme: 85-100. Ding, R. G., Lu, G. Q., Zhu, Z. H. and Yan, Z. F. (2005). Effect of micropore structure of activated carbon fibers on hydrogen storage. In: 2005 ARC Centre for Functional Materials Annual Conference, Sunshine Coast, Queensland, Australia, (). 1-3 December, 2005. Lu, G. Q., Diniz Da Costa, J., Zhu, Z. H., Yao, X., Duke, M., Ding, R. G. and Meredy, R. (2005). Functional nanomaterials as adsorbents and membranes for clean energy technologies. In: 5th Asia Pacific Conference on Sustainable Energy and Environmental Technologies (APCSEET), Wellington, New Zealand, (). 9-11 May 2005. Lu, G., Zhu, Z., Xiangdong, Y., Hui-Ming, and Hartori, (2005). Metal-carbon Interactions in Adsorption and Catalysis. In: Carbon 2005 International Conference on Carbon. Carbon 2005 International Conference on Carbon, Gyeongju, Korea, (). 3-7 July, 2005. Zhu, Z., Li, L., De Marco, and Lu, G. (2005). Synthesis of turbostratic carbon black from pyrolysis of hydrocarbons. In: Carbon 2005 International Conference on Carbon, Gyeongju, Korea, (). 3-7 July, 2005. Zhu, Z. H. and Lu, M.G. (2003). Why is H2 released at a higher temperature than CH4 during H2O-carbon reaction? An ab Initio Study. In: 31st Australasian Chemical Engineering Conference CHEMECA 2003. 31st Australasian Chemical Engineering Conference CHEMECA 2003, Adelaide, Australia, (1-7). 28 September - 1 October 2003. Zhu, Z. and Lu, M.G. (2002). Molecular Engineered Porous Nanocomposites of Metal Oxide and Clay Using Surfactants. In: S. Komarnens, J. C. Parker, R. A. Vala, G. Q. Lu and J. Matshushita, Nanophase and Nanocomposite Materials IV. Symposium V: Nanophase and Nanocomposite Materials IV, Boston, Massachusetts, (9-18). 26-29 November 2001. Zhu, Z. and Lu, G. (1999). Activated carbon-supported catalysts for N2O reduction. In: Chemeca' 99. Chemeca 99, Newcastle, (1085-1091). 26-29 September. Zhu, Zhonghua (2002). Fundamental study of carbon reactions with oxygen containing gases using quantum mechanics calculations PhD Thesis, School of Engineering, The University of Queensland. Value adding to agriculture waste by catalytic gasification to bio-fuel production.